A care home manager who admits her job has kept her going since losing her husband to a brain tumour is celebrating a national award nomination. Grandmother-of-four Janet Paynter says her “family-orientated” personality and ability to listen has been a winning combination at Treetops Care Home in Brynmenyn, Bridgend, where she has worked for the past 28 years. The 63-year-old, from Queens Street, Tondu, Bridgend, admits life has been difficult since her husband David, 57, lost his battle against a brain tumour three years ago but says her passion for care and making a difference to people’s lives has helped her cope. The former hospital cook is now the toast of the care industry after receiving a coveted nomination for the Outstanding Service gong in this year’s Wales Care Awards. Janet, who has a daughter, Claire, 43, and a son Clive, 40, will now attend a glittering awards ceremony at City Hall in Cardiff on November 17. The event, known as the social care Oscars, will be hosted by tenor and radio presenter Wynne Evans, best known as Gio Compario from the Go Compare TV adverts. Janet, who worked as a cook in Glanrhyd Hospital in Bridgend where she met her husband, a hospital porter, before moving across to care work, said: “I feel fantastic about being shortlisted. I don’t normally like any fuss or praise but I do feel special and my family are very proud. Janet, who hasn’t had a day off sick in 28 years, began working at Treetops in 1989 as a care assistant, gaining a number of on-the-job qualifications over the years before deputising for the former manager after around 10 years. The manager’s post came up 18 years ago and Janet successfully applied. The 31-bed care home provides residential care for elderly people including those living with dementia and Janet says it has become her “second family”. 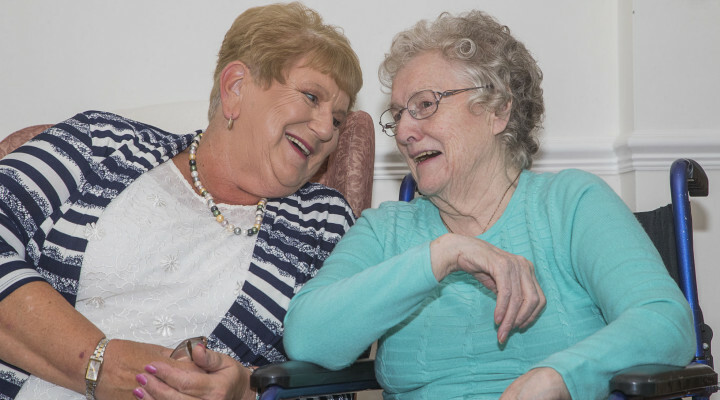 The fulfilment she gets from her job was a lifeline in the early days of bereavement and Janet says she couldn’t have coped without having the home as a purpose to get up every morning. “My family gives me purpose and my grandsons but my job is so important to me,” she said. “My job keeps me going. I don’t class it as a job. I love talking to the residents and staff and a problem shared is a problem halved. “David wasn’t even ill leading up to his diagnosis so it came as a bit shock. He came home one morning from his job at a parcel firm and didn’t look very well. We went to the doctor and they sent him for tests at the hospital. I honestly thought he’d had a mini stroke but he had a grade four brain tumour. “They gave him a year but he was dead within eight weeks. He passed away in the car on his way home from hospital one day. He put his hand on my knee and gasped and then he was gone. Janet said there was never any question that she would work in the care industry as looking after people is part of who she is. “I was brought up by my grandparents and I looked after them as they got older. My grandmother, Margaret Green, was 55 when I was born and so I looked after her in old age,” she said. “My granddad, Cyril, was 82 when he died and my grandmother was 86. I’m still living in the house they brought me up in. “I’ve always been caring. Growing up, I knew everyone in the street and would always go and help the older lady next door or make a dinner for the old man who lived across the road. I’d known them all my life. “I wouldn’t do anything else. If I retire here I will volunteer and come and chat with the residents. Lots of clients don’t have anyone to visit them and they need someone to talk to. Sometimes it’s all they have. Janet is looking forward to the awards ceremony and plans to bring her daughter, Claire, along for support. “It’s such a rewarding job. I’m not a person who takes praise very well,” she said. “I love my job, I get pleasure out of it because I’m giving to others. That’s all I need. Nominating Janet for the award, Ramesh Patel, operations manager at Careinn Ltd, which owns the home, said: “Janet does not see the residents at Treetops as residents, or as service users, or clients. She treats them as members of her extended family.